Students of IIM Ranchi cheered in blue and white as RPG blizzard hit the institute. 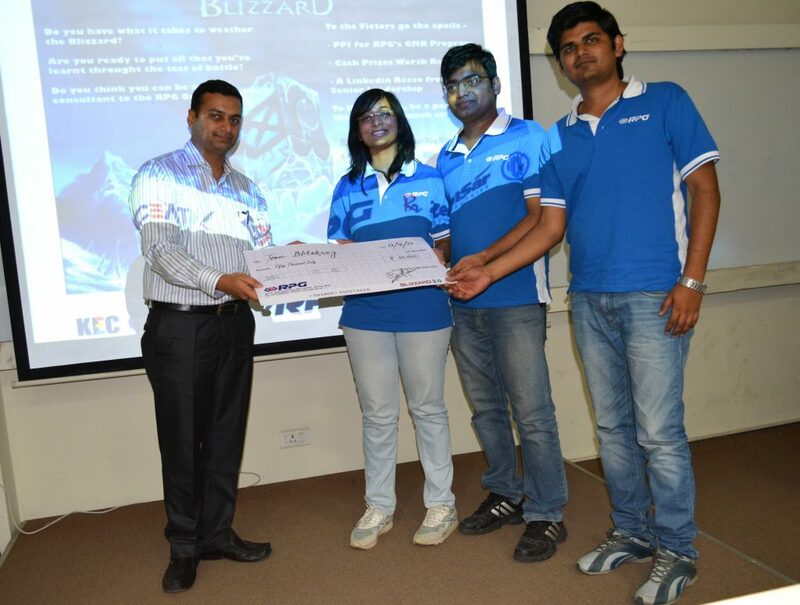 RPG Blizzard- ‘Campus Experts’ is a unique case study challenge held across top B-schools of India. Each year, it beckons young minds of the country to tackle business challenges, thus engaging them in a productive brainstorming session. Students of IIM Ranchi battled it out through various rounds of the case study competition and brought forth solutions and ideas for case studies dealing with major management domains of marketing, finance, HR and strategy. The jury from RPG included Mr. Saurabh Sood– Senior Manager, KEC Int’l Ltd, Mr. Ranjan Sarkar—GM-HR, Ceat Ltd. and Mr. Indrojit Saha from the HR group of RPG. The winners- Team Blitzkrieg (Manogana Narayanam, Nishant Chauhan and Rasa Rahul) bagged a prize money of Rs.50,000 while the runners up-Team Iguanas (Pulkit Bohra, Pulkit Mathur and Tarun Gupta) won Rs.20,000. RPG also awarded Dilleswar, winner of ‘Brand it’- a poster design competition and Nitish Jain, winner of weekend online quiz hosted by the company. Overall, the whole event was a great learning opportunity for the students and resulted in creation of a large idea-pool for RPG enterprises. IIMU and National University Singapore partake learning insights logrolling on a common platform!